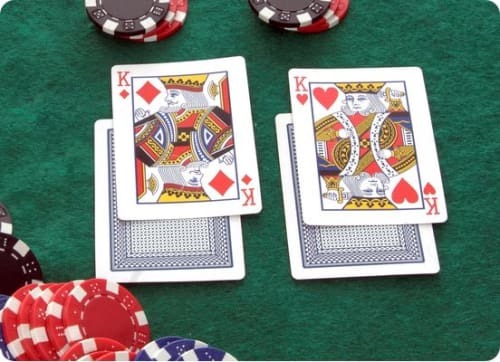 The possibility to split a pair was introduced in blackjack as a way to lower the house edge, but unfortunately a lot of players tend to split their pairs without any mathematical thought behind it. It could be that a pair is split every time one is being dealt or the other way around – that the split option is never used. This has resulted in an advantageous option for us players becoming a way for the house to increase their edge even further. In the following article we’ll however make sure to put an end to this. By using the optimal strategy, basic strategy, we will teach you when it’s mathematically correct to split a pair. Not only will this lead to some of your losing hands becoming winning ones in the long run, but you’ll also be able to maximize your winnings and minimize your losses. When you aim to play optimally by using basic strategy, the question whether or not you should split a pair is the second one you should ask yourself. The first one to ask is always whether or not it’s better to give up the hand by using the surrender option. If the answer is no to that question and you’re looking down at a pair, it’s then time to ask yourself if a split would be beneficial or not. If you would like to split a hand, this must always be done before hitting a card or choosing to double down. The alternative will also only be available when you’re dealt two cards of the same value. If you for instance were dealt 4 – 4, you can choose to play the hand as a value of eight or split it into two hands that each has a value of four. If you choose to split, you would have to place an extra bet at the same amount as your original bet so that both hands would each have a stake of the same value. When it’s mathematically correct for you to split a pair depends on the number of decks in play, what the table rules are, what type of pair you have been dealt and what the dealer’s card is showing. If the dealer has to hit on soft 17 or not usually doesn’t impact the pairs that are correct to split, even though there are a few exceptions. What on the other hand has a great impact is if it’s allowed to double down after a split or not. If this is allowed at the table it’s mathematically correct to split a lot more pairs than if it’s not allowed. If surrender is offered at the table or not also has an impact, but only on a few hands. In the tables below you’ll find information about which pair should be split depending on what the dealer’s card is showing, how many decks are being used and what the table rules state. You’ll find your starting hand in the most left column, whereas the rest of the columns show what card the dealer must have for a split to be mathematically correct. S17 means that the dealer must hit on all soft 17, whereas H17 means that the dealer must stand on 17, no matter the cards. DAS is short for “doubling after split” and NDAS for “no doubling after split”, which shows if it’s allowed to double after a split or not. There are three different reasons to split a pair, which all result in lowering the house edge. The first reason is that profits over time will be maximized from hands that are in favour of winning. The second is that losses over time will be minimized for certain hands where the odds are against you. The third and last reason is that you’ll be able to turn some of the hands where the odds are against you into hands that in the long run will win. Let’s illustrate this by one example from each category. Let’s assume that you’re sitting at a table that is played with eight decks and where the rules state that it’s not allowed to double after a split. You’re being dealt 9 – 9, while the dealer is showing a 6. Your hand value of 18 is quite good against the dealer’s 6 as you on average will win 64% of the time if you decide to stand. Should you play this hand 100 times and bet €1 each time, you would on average make a net profit of €28. This is because 64 of your 100 hands would win and give you €64, while the remaining 36 hands would lose and lead to a loss of €36. The difference between these amounts is €28 (€64 – €36). Even though this is profitable, you’ll on 100 hands on average be able to reach a net profit of €40 if you decide to split instead, which is €12 more. By splitting you’re actually lowering your chances of winning down to 60%, but as 60% is still in favour of winning the hand and you’re able to place an extra bet, this will generate a higher profit over time. If you’re playing the hand 100 times, you’ll on average win 60 of them, which with a double stake will give you a profit of €120 (€2 * 60 won hands). The remaining 40 hands will become lost and with a double stake this will lead to a loss of €80 (€2 * 40 lost hands). This results in an average net profit of €40 (€120 – €80), which indeed is €12 more than the €28 you would have gotten if you chose to stand. Let’s assume that you’re still sitting at the same table with 8 decks in play, but this time you’re being dealt 7 – 7, whereas the dealer is showing a 2. Your hand value of 14 is not very good against this and therefore you’ll on average lose 64% of the hands, whereas you’ll win 36% of them. If you bet €1 on every hand and play a total of 100 hands, you’ll on average lose €28 (€64 – €36). If you decide to split the hand you would get two hands with a value of 7. You would still be an underdog to win the hand, but you wouldn’t lose as often. On average you would lose 55% of your hands, whereas 45% of them would win. As you’re required to place an extra bet when you decide to split, you’re stake would be a total of €2. On the 100 hands played you would on average win €90 (€2 * 45 won hands) and lose €110 (€2 * 55 lost hands). This would result in a net loss of €20 (€90 – €110), which means that you on 100 played hands on average would lose €8 less by splitting. Once again let’s assume that you’re still sitting at the same table and that you once again were dealt 7 – 7, but that the dealer this time is showing a 6. Even if the dealer’s 6 is better for you than the 2 in the above example, you’ll still have the odds against you and lose money in the long run. On average you’ll win 42% of your hands and lose the remaining 58%. If you’re playing 100 hands with a stake of €1 each hand, you’ll on average lose €16 (€42 – €58). By splitting your 7s you are however able to get an advantage in the hand as a 7 will win over the dealer’s 6 in the long run. By splitting you’ll on average win 52% of your hands and lose 48% of them. As you’re placing an extra stake when splitting, 100 hands will on average give you €104 (€2 * 52 won hands) and lose you €96 (€2 * 48 lost hands). This would result in a net profit of €8 (€104 – €96). By choosing to split your hand, you would in other words turn an average loss of €16 into a profit of €8. Splitting a pair is often used at the wrong times or not at all, which is unfortunate as it’s possible to lower the house edge by making the correct mathematical decisions. Pair splitting plays a very important role in the optimal blackjack strategy, basic strategy as it’s always the second thing one should have in mind when using it. This is after having considered if it’s possible and/or the best option to surrender the hand. By making the correct mathematical decisions when splitting pairs, it’s not only possible to turn losing hands into winning ones, but winnings will also be maximized and losses minimized. This is possible by getting a better starting position in the hand and by placing an extra bet whenever in favour of winning it.